Hansen Bay Beach proprietress Thalia Reyes (left) and her cousin Doña enjoy their new table umbrella. Thalia Reyes has grit. And that perseverance has worked well for her. Indeed, maybe Irma and Maria were just another challenge to navigate like others she has overcome. Hansen Bay Beach has been in her family for 300 years (literally), since her great-great-great grandfather Mr. George, most likely from Tortola, claimed title to most of St. John’s East End in 1716. Like most areas of the island, Irma and Maria did not spare Hansen Bay Beach. Nor did they pardon Thalia’s home, on the steep hill above, which was destroyed in the storms. But like so many others focused on bringing the island back, Thalia is resilient. She and her cousin Doña are not only getting their own lives back in order, they are also making sure the popular beach destination they own and manage comes back together as well. 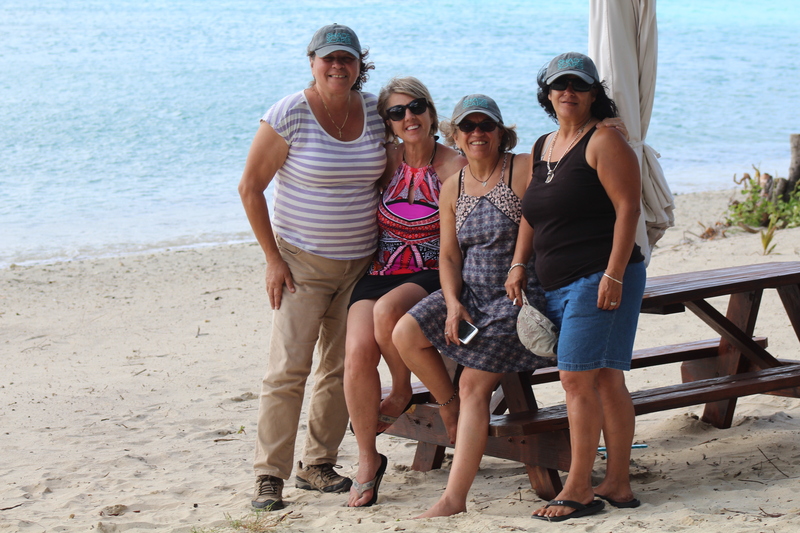 Thalia and Doña from Hansen Bay Beach with Lori (center-left) and Jo (center-right) from St. John Shade Project. New for 2018 at Hansen Bay Beach is the soon-to-open Captain Awesome’s food truck, serving up tacos and other treats, operated by Rick and Hali Sunshine Smith-Wilson. Rick and Hali’s story is also an interesting one. Their ride through the storms was a bit harrowing, with many of their off-island friends and neighbors worried about them for almost a week before they were determined safe. Just moved to Bordeaux Mountain on St. John the week before Irma, and ready for their next chapter, the back-to-back hurricanes hit and changed their plans. They, too, persevered and their new top-of-the-line food truck got off the boat just days before the St. John Shade Project team arrived to bring some shade to Hansen Bay Beach. They spent a day kicking back with some new friends, both locals and tourists who trickled in and out. Many had stories about how they beat Irma and Maria, and many made new connections and re-connections on the beach. The St. John Shade Project team with the Hansen Bay Beach and Captain Awesome’s food truck crew celebrate the new table umbrella. The St. John Shade Project crew installed two table umbrellas on the beach. Nearby, a beautiful and historic tree serves as the centerpiece of this special East-End site. Sitting back from the sloping, white-sand beach where Captain Awesome’s food truck sits, visitors can easily park and enjoy the beach chairs, tables and umbrellas while taking in the view toward Coral Bay to the west. The beach is dog-friendly in honor of a promise Thalia made years ago to one of her beloved four-legged friends. Donations are important in helping to keep everything running smoothly. It’s great to see Hansen Bay Beach back, with both familiar and new faces. As a member of the St. John Shade Project team, I was honored to visit this special and locally loved place, and to feel a little like a St. Johnian with the warm welcome I received. Hearing the amazing story of Thalia’s success in securing her family’s right to ownership and her commitment to keeping it open for the public was inspiring. The partners at Hansen Bay Beach are working hard to offer this gem of a beach to locals, visitors and newcomers alike. Our crew is honored to bring shade to the beach and to the new food truck. We are thrilled to play a role in the efforts happening to keep St. John the place it has always been. The ShadeScapes umbrellas are a perfect place to relax and enjoy some tacos from Rick and Hali’s food truck. There is nothing better than quality beach time, with maybe a story or two, to add the perfect touch to your visit to the East End of St. John, USVI. 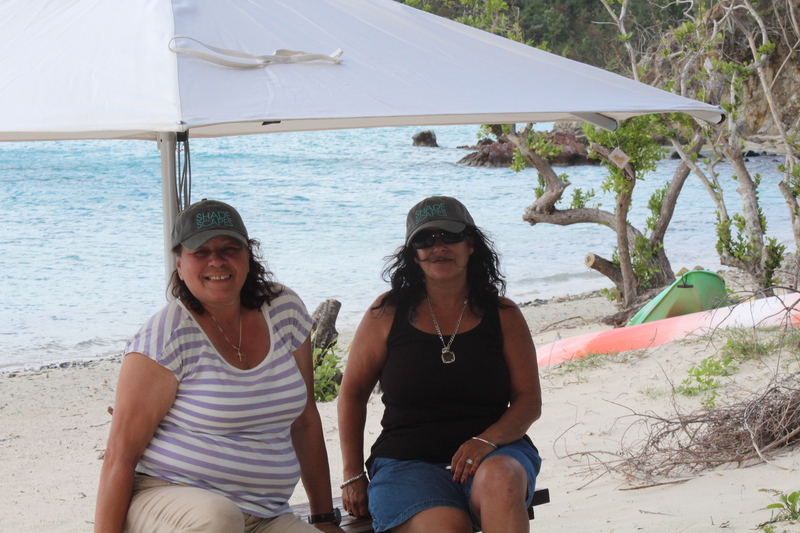 Doña and Jo inspect one of the new shade umbrellas at Hansen Bay Beach. 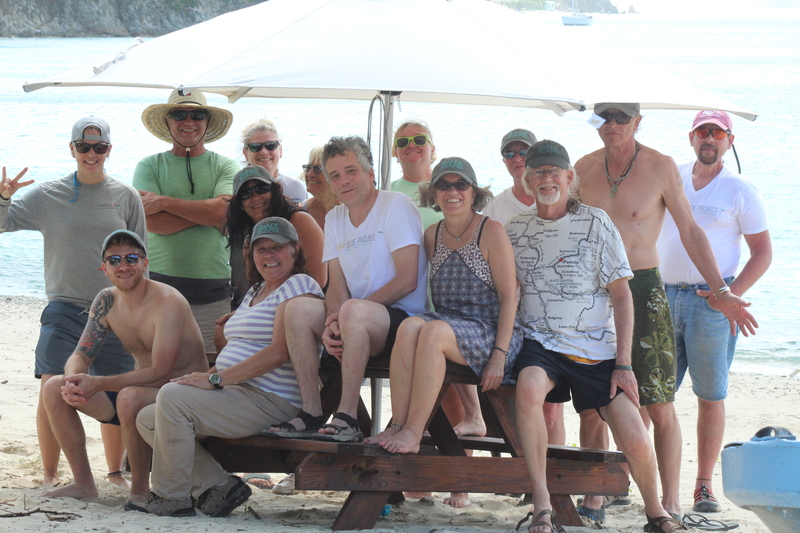 Some of the St. John Shade Project team talk shade at Hansen Bay Beach.